The E1L-A uses the same aerospace aluminum body and tailcap as previous generations of single-cell E-series lights, with a Mil-spec hard anodized finish and 2-way steel carry clip. The knurling on the body and tailcap provide adequate grip when using the E1L-A in a cigar hold. As with the EB1 and E2DL Ultra, the E1L-A features a completely redesigned head with a spring contact for the positive battery terminal. Designated as the KE1, the E1L-A head shares the same exterior design as the head on the E2DL Ultra, minus the crenelations, and features a band of flat surfaces around its circumference. Unfortunately, due to the short overall length of the E1L-A, these flat surfaces do not provide any anti-roll capability. The E1L-A can be broken down into its component parts (head, body, and tail cap) which are interchangeable with those from earlier E-series lights. The E1L-A is slightly longer and heavier than previous versions of the E1L, with the difference due entirely to the increased size of the new head. As a result, the E1L-A is front-heavy but due to the small size of the light, this has not been an issue. I have always been a fan of the SureFire 2-way pocket clips and was very pleased to learn these would be included on the new E1L-A. However, the copy I received had the same short, straight pocket clip as found on the earlier versions of the E1L, E2E, L4, etc. A quick e-mail to SureFire confirmed that this was in error and I received a new 2-way pocket clip in a couple of days. 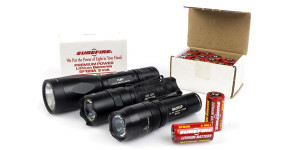 Kudos to SureFire for the quick response. Even with the increased size of the KE1 head, the 2-way clip holds the light securely when clipped to a pocket and is more than adequate to attach the light to the brim of a cap. With its small size, the E1L-A is extremely comfortable to carry when clipped in a jeans pocket. As expected for a TIR-equipped light, the E1L-A provides a beam that is more tightly focused than what one would expect from such a small light. The center hotspot is bright enough to easily recognize objects at distances approaching 50 yards. The light also provides a fairly wide spill beam which is effective to 15-20 yards. The E1L-A beam appears smoother with less obvious rings than older generation TIR lights, such as the E1B and E2L. However, this difference is only noticeable when illuminating flat surfaces from up close. The spill provided by the E1L-A is broader than these earlier lights but is not as bright. When compared to other TIR-equipped lights, the most notable characteristic of the E1L-A beam is its green tint. The tint is very pronounced when illuminating lightly colored surfaces but is much less noticeable during general use. In terms of overall output and beam profile, the E1L-A compares closely to the E1B Backup (110 lumen), E2L (KX2, 45 lumen), and L1 (65 lumen). The photos below show side-by-side comparisons of the E1L-A to these lights in a variety of situations. The spill was greater than what is shown in the photos. The beams can be compared across the full width of the image using the slider, while additional images can be accessed by using the navigation buttons in the bottom-right corner. Extended runtime is the hallmark of the SureFire Outdoorsman series of lights and the E1L-A does its part to maintain that tradition. 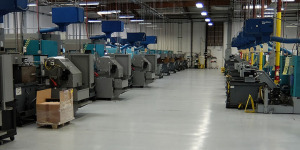 The extended runtime is achieved, in part, by stepping down to 75% output after 2 minutes of operation. The step-down is barely noticeable and, in fact, I did not notice it at all while actually using the light. It only became apparent as I was conducting the runtime test. The E1L-A maintains this level of output for another 5.5 hours before falling out of regulation and declining in output down to 10% at the 6 hour mark. The E1L-A was still producing a small amount of light at the 7 hour mark when I ended the test. Over the course of the test, the head of the E1L-A never felt warm to the touch. As the battery voltage began to drop, the E1L-A reached its “highest” temperature, only 3 degrees Fahrenheit above ambient temperature. The E1L-A Outdoorsman is well suited for its intended usage as a general purpose outdoor utility light with its compact size, long runtime and respectable output. In terms of output, it compares well with earlier models which traditionally were more powerful than their ratings would indicate. However, it appears the design of the E1L-A was focused more on the increased runtime than sheer output. With this in mind, I consider the programmed step-down after 2 minutes of runtime to be a good compromise between output and runtime. In most cases it won’t be noticed and, if that extra 25% output is truly needed, the light can be reset to full output by simply switching it off and back on again. Excellent runtime with 5.5 hours of regulated output followed by well over an hour of diminishing, but useful, output. Very green tint to beam. I’m fairly tolerant to tinted beams and in general use, the E1L-A beam works fine for me. However, it can be somewhat distracting in some cases. 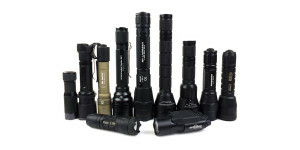 Current retail prices (~$180) are high when compared to other SureFire lights with similar specifications. Expect these to drop as more retailers get the light in stock. My only two wishes for the E1L-A would be 1) a little less green tint and 2) lower price. The E1L-A Outdoorsman is compatible with SureFire’s new F04-A Diffuser, F05-A Red Filter, and F06-A Blue Filter. Visit their mini-review to see more about these attachments as well as beamshots when used with the E1L-A. 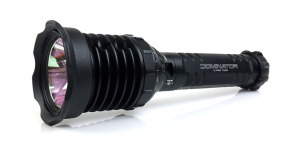 Additional information about the E1L-A can be found on the SureFire website. Share your thoughts or questions in the comments section below or head over to CandlePowerForums and join the discussion there. The following photos show the E1L-A with both the 2-way pocket clip as well as the older short and straight clip. New E1L-A’s should be shipping with the 2-way clip installed. Great job on the review! Assuming the E1L-A’s ouput is exactly 90 lumens, It seems that the old L1’s output is on par with that of the E1L-A (if my eyes are correct, the L1 is even brighter); it should be in the ballpark of 100 lumens, which is way higher than the rated 65 lumens. Thank you for the comment. I would say you are correct with your estimation of the L1’s output. It is one of the later (last) versions of that light and it actually measures in with a slightly higher output than my 110 lumen (rated) version of the E1B. You can find some charts and other data about the light in my review of the EB1. SureFire has been known for their lights being under rated (or over performing) in the past, sometimes by a considerable margin. I believe this was due to SureFire being conservative with their measurements and also due to them not revising the specifications every time there was an improvement to the emitter. Do you mind telling me the serial number of the L1 tested? Is that an old logo L1 or a new logo L1? The serial number is A19402 and it has the new logo. David, I just tried it with a LX2 body running one CR123 and a battery spacer and it did not work well at all. However, it should be noted that the spacer I’m using is slightly shorter than a regular battery so I don’t know whether that contributed to the problem. The head from the E2L-A would be a better test so I will try it when I get one of those for review. That would be great! Thanks a lot Jim! Or how about that M600U head on the lx2 body…. 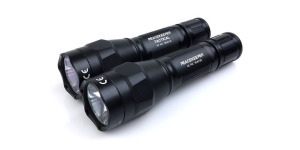 I received confirmation from SureFire that the M600/620U heads would function as 2-stage heads on the LX2 body. I tried a new E2L-A head on the LX2 body and I can say that it works but not without fault. Generally it behaves pretty well with low and high modes as you would expect but it can get out of sorts if the switch is quickly cycled. On some instances I would get a pre-flash in low mode and a couple of times I had low output even with the tail switch fully depressed. My preference is to use the provided clips when carrying the lights, however, they are easy to remove if you feel the need. Aside from the output levels I think the user interface is the biggest determining factor for most people. The E1B starts in high mode and advances to low after an additional click while the E1L-A is the opposite, always starting in low. Which is better would depend upon your planned usage. If you intend to use the light with your eyes already somewhat adapted to the dark (i.e. camping) then the E1L-A may be your best bet. Also, don’t forget about the earlier versions of the Outdoorsman lights which are still available from retailers at reduced prices. For example, the older E1L is a pretty good value at under $100. Thank you sir for your response. I noticed that on SF’s website, they are offering the EB1 without the shroud so the interface is half-press low, full-press high and then twist for low, twist more for high. So the differences in use become more narrow, except for output and runtime and the fact that the EB1 is a little longer and heavier than the E1L-A. Is the rim of the shroud flush with the top of the button on the EB1? I was looking at the photo your provided with all the lights lined up and was wondering if the EB1 would be shorter without the shroud so closer to the E1L-A or if it’s the same length shroud / no shroud. The E1B is also still available online and provides the same specs as the E1L-A practically for around $99 (not sure of differences in beam profiles) but I believe it is only available high-low so your point becomes very valid. Did you find the knurling on the E1L-A very aggressive/sharp? Some reviewers have said it “catches” on clothing. I would be using it primarily in jeans / cargo shorts pockets so wondering if it will really tear through or if the issue is overblown. I noticed on your review of the EB1 that you state the smooth body is easier on clothing. Many thanks. PS: I will be primarily using this for camping, night hikes and every day use as needed and if I can mount it on my bike, great! I wish it came in black. On the EB1 Clicky (like shown in the photo) the button actually protrudes slightly beyond the shroud. I do not have one of the momentary versions you describe but I would expect it to stick out at least as far as the clicky. Generally, I would describe the knurling on the E1L-A as being fairly aggressive, like on most SureFire lights, but it’s a small light and there is so little of it. If you are carrying the light bezel down with the 2-way clip, the knurling won’t even touch your pocket, aside from incidental contact. I don’t see how it would cause substantial wear. If carried bezel up, I would say that there is a possibility of increased wear to the fabric inside the pocket between the clip and the knurled tailcap. To me the length of the lights is the biggest difference in carrying the EB1 vs. the E1L-A. All of the EB1’s extra length is above the clip (when carried bezel down) which means both lights go the same depth into the pocket. The extra bit sticking out above the pocket can be an advantage or a disadvantage depending upon your use and preference. In my opinion, the EB1 is easier to grasp and withdraw in a cigar grip while the tailcap of the E1L-A is less likely to snag on obstructions due to being almost flush with the top of the pocket. In your case, I think your decision will come down to which level of output and user interface best suits your needs. Generally speaking, the Outdoorsman lights (E1L, E2L, and E2LAA) are made just for the usage you describe. Their output is adequate for working around camp and navigation at night while providing a longer run time. Keep in mind that this means you have to pack fewer batteries with you. Just to follow up, I ended up purchasing the E1L-A and taking it with me on an 8 day adventure to the Sierras. I am very happy with my purchase. The flashlight is small and light and therefore very easy to carry around in one’s pocket and the batteries last long enough that with my usage patterns, I won’t have to worry about replacing them for some time. While there are much brighter lights of a similar size, I opted for the extended battery life which is perfect for worry-free outdoor use (as opposed to “security” uses). The light on the “high” mode is plenty bright for negotiating dark paths. The “low” mode is just enough for a tent, reading etc. without going blind. Having the low mode come on first makes sense for my use case. All of these points you have duly noted. While the prices are certainly steep, the build quality is top-notch. I feel that this light will be able to take any unintended abuse and have no fears taking it with me anywhere. In fact, this sized light, no matter which power one purchases, is perfect for pocket carrying. For anybody debating a SureFire flashlight, you will not regret it. I am so satisfied that I am tempted to purchase a second light just to keep in my car. Your advice has been detailed, cogent and extremely useful. Many thanks for sharing your expertise with us all. 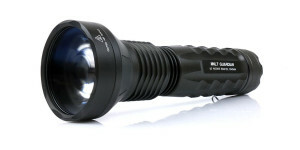 I am a huge fan of 1xCR123 lights, specially about Surefire lights. I gotta say E1L is the best light ever made, in my opinion. It´s small, only 2 modes (KISS principle) with low mode first, natural HA (I love naturals…), optics (I love throw…), good knurling, and a good compromise between output and runtime. With a F04 diffuser it became a awesome light for every situation! And now Surefire release this new E1L-A. It looks like a dream coming true! But we got a problem: the green tint. I hate green tints. I also sold 2 old L1 that I had due to it´s terrible greenish tints. What shoud I do? I mean, this light looks a winner, but I´m afraid about the tint lottery. Do you think green tint is a rule? Or do I have a chance to get one a little less greenish? Hello LG, thanks for the comments and for visiting the site. I agree with you that the E1L is a truly versatile and useful light (I would include the E2L as well). In my opinion the E1L-A is not a tremendous upgrade over the previous version with the KX1B head. It does have the potential for more output and I actually like the beam profile a little better. However, it’s not as much of an “upgrade” as seen with the E2L-A, E2DL Ultra, EB1, etc. I would suspect at least a somewhat green tint is here to stay for a while. All of the recent SureFire lights I have reviewed exhibit this characteristic with it being most noticeable in the low modes. Having said that, the tints of my E2LAA-A and E2L-A have MUCH less of a green tint so I would say it’s very possible my E1L-A is an exception. The E2L-A does use a different emitter but as far as I know, the E2LAA-A emitter is the same. At initial turn-on the E1L-A is about 10% brighter than the E1L with KX1B head. After the E1L-A output drops it is about 20% less than the E1L with KX1B head. Of course full output can be restored by switching the E1L-A off and back on but that’s not the most practical solution if you really need that amount of light. I have posted a chart showing this comparison in the CandlepowerForums thread linked at the end of the review. When compared to older versions of the E1L (such as the KL1), it is no contest, the E1L-A blows them away. I was thinking… In real world (in my job), rarely I use a light turned on more than 2 minutes. It´s always cycling through modes or being turned off. So this new feature does not bother at all. The problem is the green tint. I think there is still a lottery: some lights with a lot of green, other ones with less green. I think I´ll give a shot. Crossing fingers for a less greenish tint! Have you receive the new e1l-a yet?? I didn´t get it yet. My friend got one last week and it´s tint is too greenish in low mode. Terrible! I hate it! Meanwhile, I just got another E1L (with the KX1B head). It´s a great little light and now has a very good discount, due to the release of this new model. You say it’s very greenish on low,how about on high? is there any slight greenish on HIGh ,please tell me! any idea of EB1 ?What do you think?Or do you suggest me to wait? Wish we both get a nice E1l-A with out any greenish !